A major new exhibition detailing the events in Lisburn from Armistice (1918) to the unveiling of the town’s war memorial in 1923 opened at the museum on June 26th 2017. The display includes rare and unusual material relating to the August 1920 ‘Swanzy Riots’, which saw much of Lisburn burned. 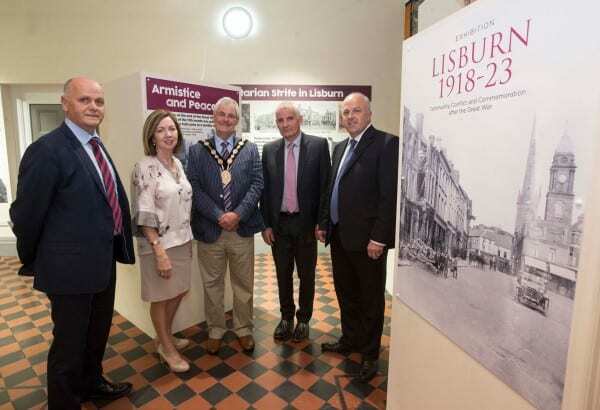 ‘Lisburn 1918-23, Community Conflict and Commemoration after the Great War’ is the final display in the museum’s now complete First World War exhibition series, which includes the popular Lisburn, 1912-1915, Rising Voices: Lisburn at Easter, 1916 and The Somme, Our Story. The new exhibition is open Monday to Saturday, 9.30-5pm. Free entry. The assassination of RIC District Inspector Swanzy in Market Square, and the sectarian ‘burning’ of Lisburn that followed the murder. Unveiling the Nicholson statue, the war memorial, and the commemoration of Lisburn’s Great War dead. At the opening Mayor Tim Morrow commended the museum for taking on this ‘difficult’ aspect of the town’s shared history, remarking that ‘one hundred years on it is important to be able to look dispassionately at the trials and tribulations of our divided society as it emerged from the Great War’, and learn from them. Alderman Jim Tinsley, chairman of the council’s Leisure and Community Development Committee, praised the exhibition’s focus on ‘the experiences of local people and organisations affected by the War’, and thanked the ‘generous support’ the museum and its collection had received from the people of Lisburn and beyond. 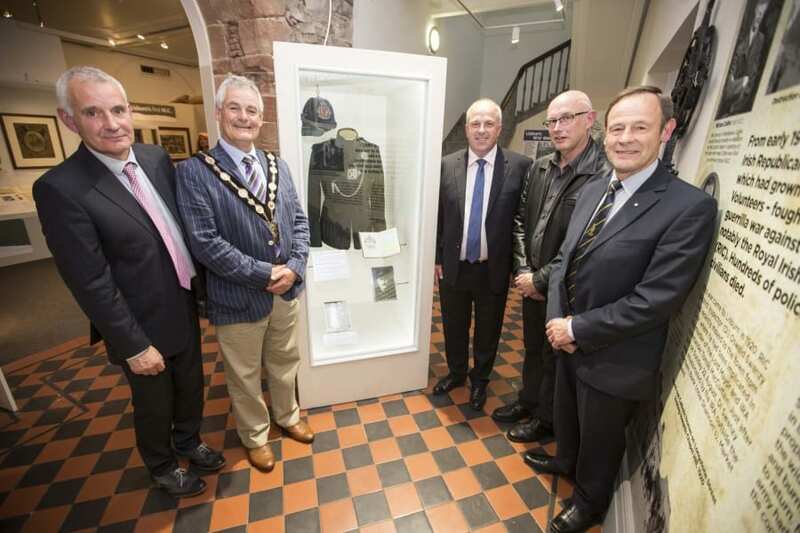 Curator Brian Mackey (L) with Mayor Tim Morrow, Alderman James Tinsley, Hugh Forrester (Police Museum) and Freddie Hall, Trustee of the Police Historical Society (NI).